This project is the outcome of an extensive literature review on HCI research on technology in the home. This literature review was conducted as my annotated bibliography during my doctoral studies. 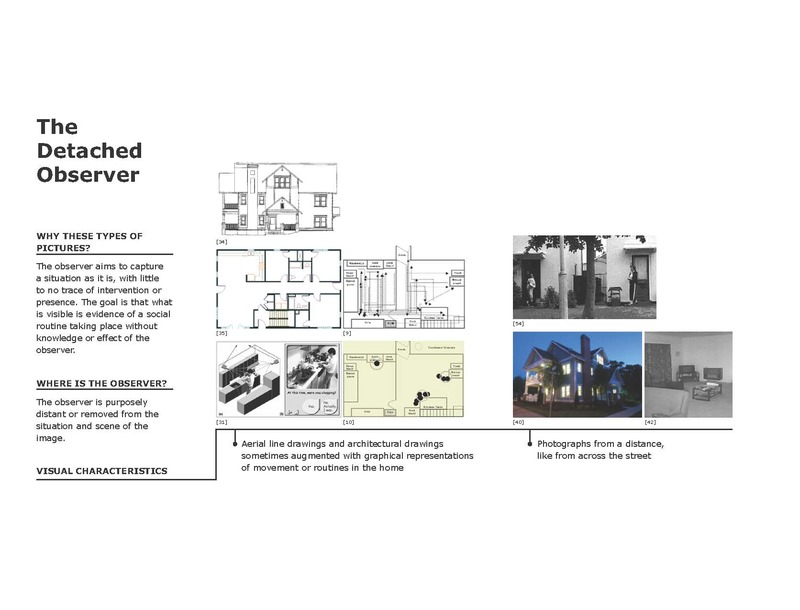 Based on a critical analysis of 121 works on the topic, we present seven genres of domestic technology research in HCI: social routines in the home, ongoing domestic practices, the home as a testing ground, smart homes, contested values of a home, the home as a site for interpretation, and speculative visions of the home. We articulate dominant research perspectives in HCI, and we offer two complementary perspectives about how to investigate the domestic experience in future research: the material perspective and the first person perspective. Following this textual analysis of HCI research on the home, we also conducted an in depth pattern analysis of the visual elements (e.g. photographs, line drawings, photomontage, floor plans, sketches, interface screenshots, etc.) included in those 121 works of HCI research on the home. 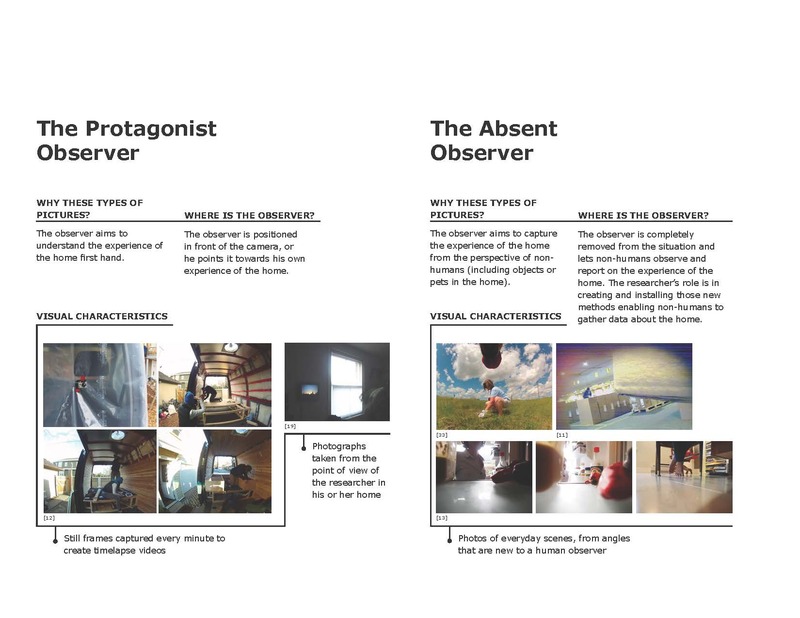 The findings show 7 types of observers and we propose 2 alternative observers: the protagonist observer and the absent observer (reflecting the two complimentary perspectives proposed in the original paper). Below are examples from our visual analysis presented in the pictorial format at DIS 2016. Project in collaboration with Ron Wakkary and Will Odom from the EDS studio at SFU. _ Desjardins, A., Wakkary, R., and Odom, W. (2015). 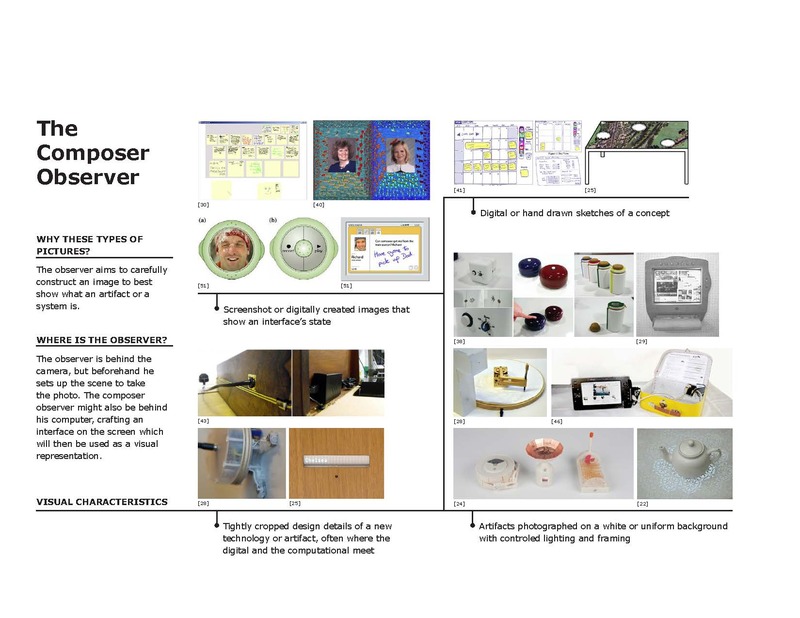 Investigating Genres and Perspectives in HCI Research on the Home, In Proc CHI 2015, New York, ACM Press, 3073-3082. _ Desjardins, A., Wakkary, R. and Odom, W. (2016). Behind the Lens: A Visual Exploration of Epistemological Commitments in HCI Research on the Home, Pictorial DIS 2016, New York, ACM Press, (in press), 12 pages. (acceptance rate 31%).